Providing a great way to properly store stemware and display the bottles being sampled at a party or tasting, this wooden wine glass and bottle rack has a rustic barnwood finish to provide added vintage appeal to the proceedings. The inverted glassware rack helps glasses dry completely, while keeping them separated and preventing dust from settling in the bowls. 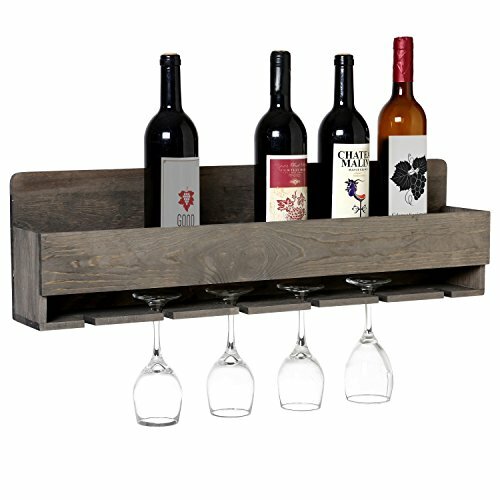 Mounted to a wall in the bar or kitchen, this weathered wood bottle shelf makes an elegant display and announces a love of wine to guests and friends. Wine bottle and stemware not include. Wall mounted wine glass & bottle display rack for 6 inverted glasses & 6 wine bottles with a rustic barnwood gray finish. Stores glasses in an inverted position for improved drying, prevention of dust settling in bowls, and separation of glasses. Provides an elegant display and store our favorite wine bottles.